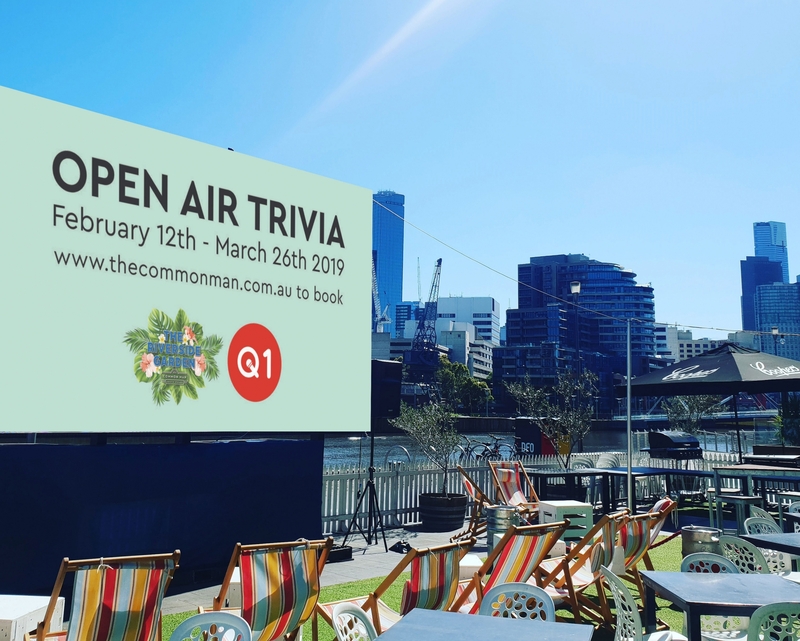 of a kind experience on Common Man’s riverside garden, with an outdoor quiz night overlooking the Melbourne city skyline and special rounds presented on our high definition 6m x 3m outdoor screen. summery cocktail jugs, Coopers beers, Squealing Pig rosé in cans and wines. Full Common Man menu available plus $10 pizzas all night! Nothing beats a fun night out with friends and colleagues by the beautiful Yarra River testing your general knowledge skills against others. Entry is free, plus you have the chance to win our weekly and bonus prizes! Bonus mid game prizes including bonus questions and activity. ​Register your team ahead of time to go in the weekly door prize pool drawn prior to the first question! ​number of people in the previous week's group.